Up until about a month or so ago, I hadn't watched Survivor for 10 years. I've since bits and pieces over the years, but never followed a season from start to finish. 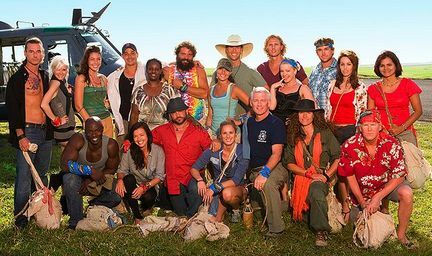 That first season of Survivor was the best. I was in year 12 when it was on, and me and my best-friend were hooked from the start! We watched every episode and then discussed it the next day at school, we had our favourites and different opinions on who we thought should win. My best memory about that first season of Survivor was that i got my P's the night of the final episode. My first time driving by myself, without anohter driver, was my trip over to my best mate's place to watch that final episode. We had such a good time, waiting with baited breath, to find out would be the sole survivor. This current season of Survivor, Heros vs Villians has been really good. I have been hooked from about 5 episodes in, there are just so much back-stabbing and blind-siding going on, it's addictive. Are there any shows that you're addicted to, that you just have to watch every week? This is mine at the moment! MasterChef! I hate TV, and normally download all my shows from the US to avoid waiting & ads, but I just have to be home every night at 7:30 to watch that cooking madness. yep!! Master chef and also a bit hooked on survivor. it is getting very interesting, just finished watching tonights episode!